PAM4 signaling represents a new step in the evolution of serial data signal formats, overcoming some fundamental limitations of traditional NRZ signaling. But with new signal types come new measurement needs. Teledyne LeCroy’s PAM4 analysis package meets these needs by leveraging industry-leading eye, jitter and noise analysis capabilities to perform eye, jitter and noise analysis of PAM4 signals. SDA II Unleash the power of serial data analysis to understand and characterize your design, prove compliance, and determine why a device or host fails compliance. SDAIII-CompleteLinQ signaling, designers of serial data systems require multi-lane analysis. 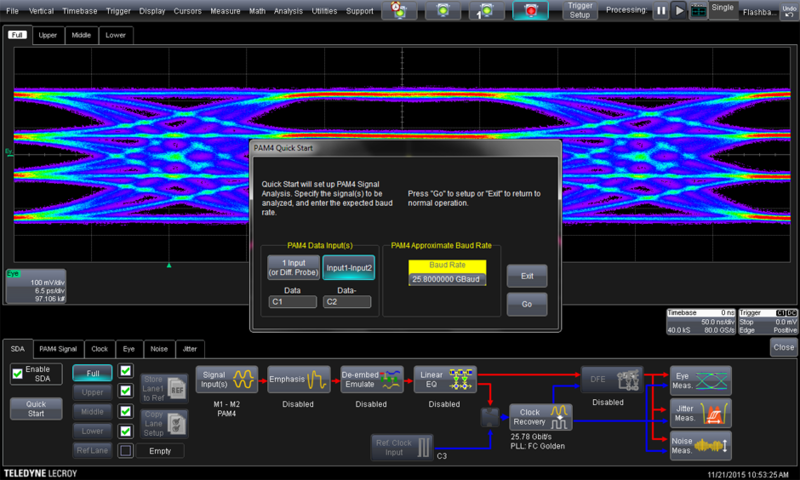 Unleash the power of multi-lane SDA analysis to perform eye and jitter measurements on up to four lanes, simultaneously. PAM4 PAM4 signaling represents a new step in the evolution of serial data signal formats, overcoming some fundamental limitations of traditional NRZ signaling. But with new signal types come new measurement needs. Teledyne LeCroy’s PAM4 analysis package meets these needs by leveraging industry-leading eye, jitter and noise analysis capabilities to perform eye, jitter and noise analysis of PAM4 signals. VirtualProbe By using VirtualProbe, you can understand the characteristics of signals where a physical probe cannot be placed, such as inside of a package or at the end of an interconnect that doesn't physically exist. You can choose to remove effects caused by elements such as fixtures that are not be present in a production configuration, and also add the effects of a device that is to be included but for which only an S-parameter model exists. Use in conjunction with SDAIII products to complete your serial data analysis solution set. Teledyne LeCroy’s PAM4 Signal Analysis gives high-speed design engineers the same toolkit they are familiar with for NRZ signalling, but utilizes sophisticated new measurement algorithms specific to the complexities of PAM4. The PAM4 Signal Analysis package performs a complete analysis of PAM4 waveforms: analyzing the PAM4 signal, creating eye diagrams, measuring the eye closure in voltage and time, and predicting the closure as a function of BER. It is fully integrated into Teledyne LeCroy’s sophisticated MAUI user interface, allowing for advanced capabilities like channel emulation and de-embedding. PAM4 Signal Analysis leverages Teledyne LeCroy’s revolutionary multi-lane serial data analysis architecture to enable separate views of the upper, middle and lower PAM4 eyes, as well as the full eye diagram. Sophisticated new algorithms enable full breakdown of jitter and noise, bathtub curves, and IsoBER visualizations of eye opening to selectable bit error ratio levels. 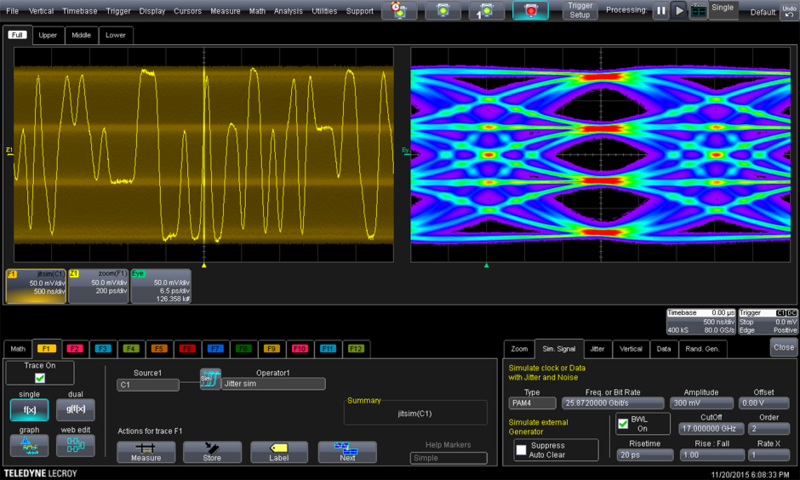 The PAM4 Signal Analysis package includes the views of noise and jitter utilized in Teledyne LeCroy’s SDAIII-CompleteLinQ software. Enhance understanding of jitter and noise by displaying histograms, spectra, bathtub and IsoBER curves for each eye opening. PAM4 analysis is fully integrated with with EyeDoctorII, allowing users to de-embed channel and fixture effects, emulate a channel, or apply equalization to open up closed eyes. 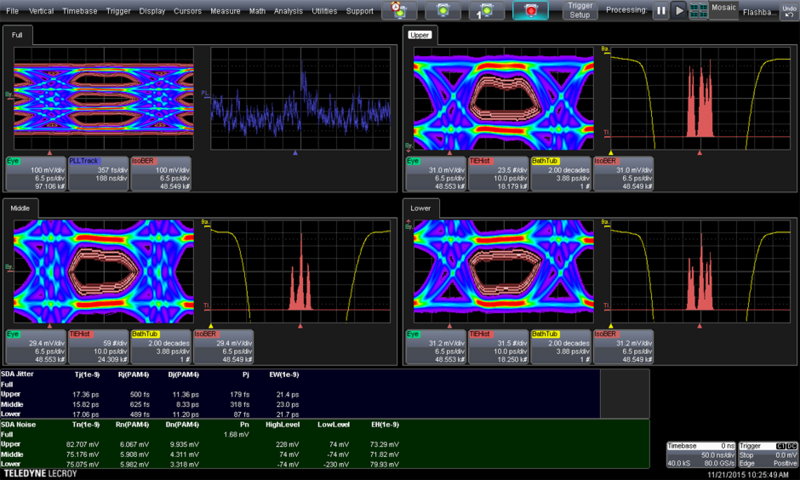 PAM4 Signal Analysis gets its user interface design from Teledyne LeCroy’s SDAIII-CompleteLinQ, the most intuitive and fully integrated serial data analysis package available. To help with the additional complexities of PAM4 analysis, a simple “Quick Start” dialog gets you up and running in seconds. 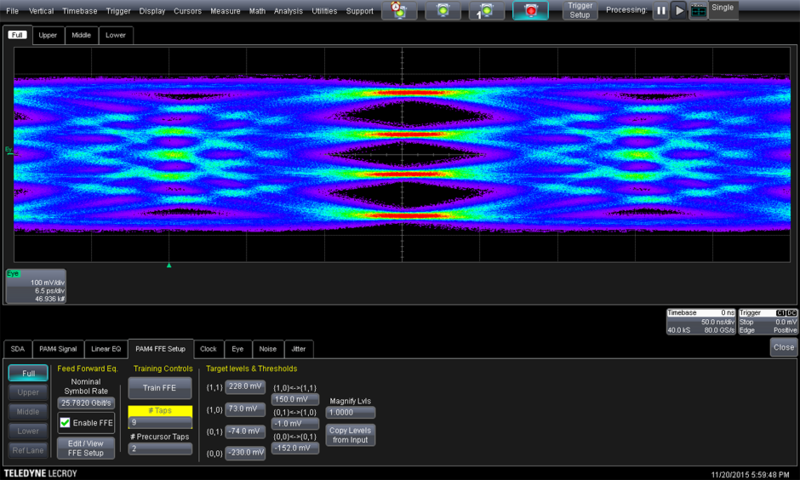 PAM4 Signal Analysis also adds PAM4 signal generation capability to Jitter Sim, Teledyne LeCroy’s built-in serial signal generation tool. This integrated functionality allows easy switching between a real signal under test and a “golden” reference signal, to help understand and diagnose unexpected issues with your test setup.